You are currently browsing the category archive for the ‘Readings’ category. I was guest poet last night at the Southern Performers Interactive Network (SPIN) Christmas Concert in a jam-packed program of poets and musicians. The event was co-organised by Julia Wakefield who I met at a writing workshop earlier in the year. 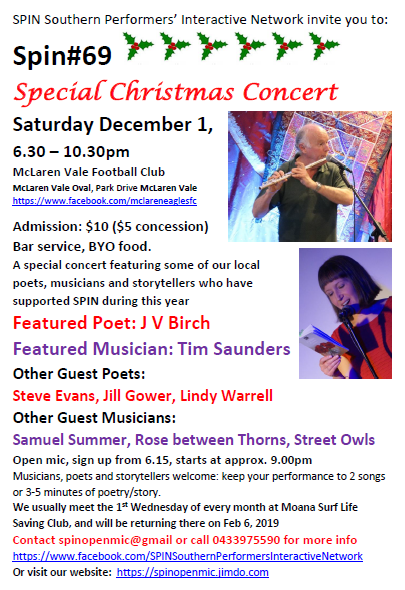 It was a wonderful evening of entertainment, alternating between poetry and music, with the first half MC’d by Maria Vouis and Steve Evans. Lindy Warrell opened the set sharing some of her Australasian poems amongst other countries, one of which was old age. Rose between Thorns stepped up next performing an excellent cover of ‘Alice’ and ‘Wicked Game’, aswell as some of their own music, followed by the fab Jill Gower who read entertaining poems about a man she met on a train in Europe and a room comparison with a friend. Then it was my turn. 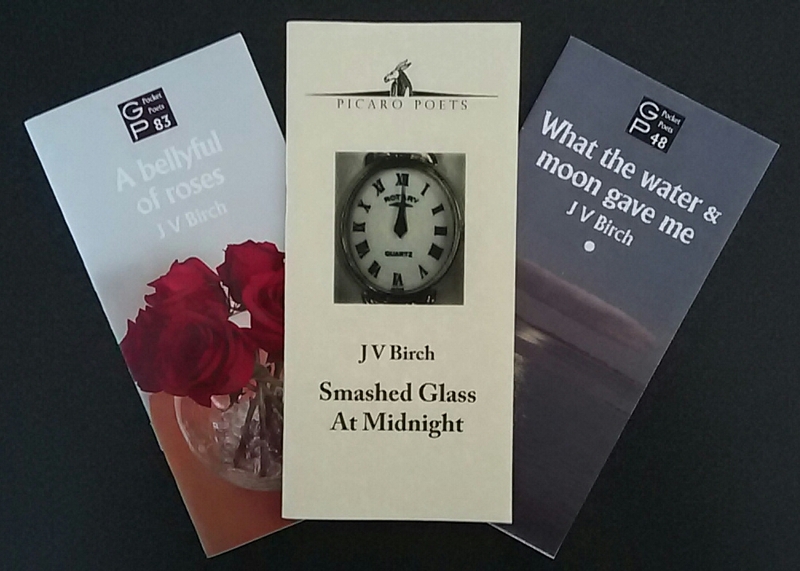 I shared poems from my three chapbooks, giving a little context before each, and one from my first full length collection due out next year. Sharing the endometriosis poems was quite timely as this was the focus of a recent Insight program, so most in the audience knew about the condition. After the break, guest musician Tim Saunders took to the stage playing a song called ‘Seflie’ on guitar and a Vivaldi rendition on flute amongst others. Steve Evans was up next, another great poet, sharing ’12 Days of Audit’ and ‘Dating Quiz’, both of which drew laughs from the crowd. Street Owls followed, playing covers of ‘Sweet Dreams’, ‘Ain’t No Sunshine’ and ‘Runaway’, which got us singing along, and Samuel Summer closed the first half who’s recording an album for a Year 12 project and has an amazing voice. An open mic session followed, which I unfortunately had to miss being exhausted from a ridiculously busy week! But I thoroughly enjoyed myself – caught up with some fellow poets, made some new friends, sold some chapbooks – all in a welcoming and supportive environment. Hoping to spin more in the future. This morning I recorded one of my poems for PBA FM’s ‘Well Versed’ Program, to be aired during next year’s Adelaide Fringe as part of Salisbury’s Secret Garden. PBA FM is a community radio station offering a diverse range of programs, giving voice to those who may feel excluded or find it difficult to participate in social, cultural and political aspects of everyday life. One such program is ‘Well Versed’ devised by Joanne Baker. Poets were invited to submit work to be broadcast as part of the program and those selected by the judges, invited to record their poem in the studio. Joanne was keen to have poets read their own work rather than an announcer, so listeners get the true interpretation of the piece. Joanne also hosts ‘Words Out Loud’. It was a great experience, a first for me, and wonderful to meet others who are passionate about getting poetry out there. A CD will be compiled of all the readings available to buy, with each being aired next February/March. So as well as hoping to be a reviewer again, I’ll be a Fringe artist, yay! I was guest poet at Poets’ Corner Monday evening, a bi-monthly event held at the Effective Living Centre in Wayville, and thoroughly enjoyed it. 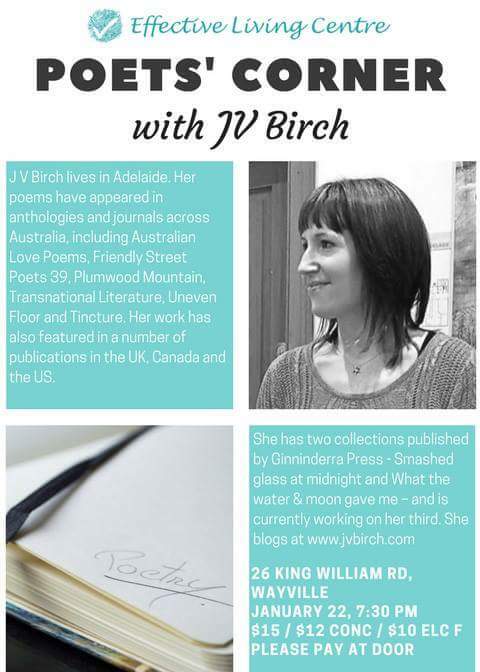 Having been recommended by Jules Leigh Koch, fellow poet, friend and a member of the group, Mary Taylor who runs the event invited me to read, which I managed to do for an hour! The centre is celebrating its 20th anniversary this year and the evening drew a small, but attentive audience. Preparing for it, a few themes emerged – family, health and travel – so I structured my reading around them. I started by talking about my background, how I got into poetry, shared my first published poem (a whole nine lines! ), and then my thoughts on the purpose of poetry and my creative process. I read 22 poems in all; some from my chapbooks and a few from the collection I’m currently working on. Questions followed. Louise Nicholas, another fellow poet and friend, wanted to know how I can be so disciplined with my writing routine. Being fortunate enough to work part time, Fridays are my writing day, plus I love to do lists and so make one for what I want to achieve that week. And if I do something not on the list, I add it on and strike it through! (does wonders for the sense of achievement). I was also asked how I find out about submission opportunities. I’ve signed up to a weekly email, Submishmash, which lists upcoming deadlines for both national and overseas publications seeking work, and also hear about them through my poetry groups, with Facebook being a valuable source too. However, I plan to cut back on the number of submissions I make this year to focus on my next (and first full length!) collection. It was a wonderful evening and I was surprised how quickly the time went. There was a short break followed by an open mic session in which others shared their own work. I sold a few chapbooks and had some interesting, and insightful, conversations. And that’s one of the many beautiful things about poetry – its power to bring people together, which sometimes, in itself, is enough.